Facebook Cheat Sheet #Infographic ~ Visualistan '+g+"
For many marketers, designers and social media experts working with Facebook, image quality is crucial. Facebook offers a variety of space to populate with engaging visual assets. However, this can make it difficult to keep track of dimensions and specs – especially since Facebook is continuously updating its image size recommendations, making it important to stay on top of the latest information to ensure your images perform well. 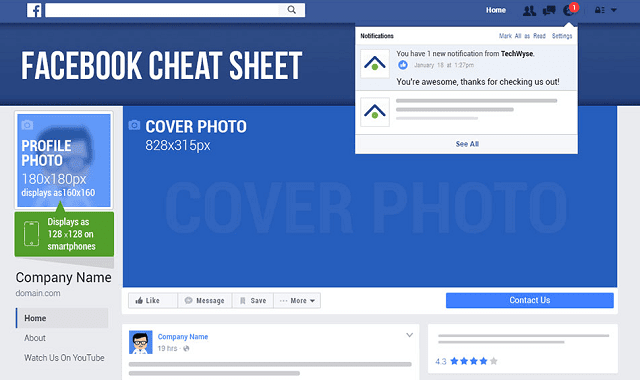 TechWyse put together the below facebook images sizes cheatsheet to help you easily see the dimensions for all types of images on this social platform. This invaluable resource includes everything from profile photos to shared images and links, photo thumbnails, videos, mobile and promoted posts, among many other dimensions. This cheat sheet is downloadable and printable, so you can simply post it near your desk or office for quick reference when editing or designing Facebook images. Dimensions vary drastically from image to image, and many people might not be aware of these variations in image size. It’s also important to note that if you do not use the recommended dimensions, Facebook will automatically choose the centre of your image. This is especially important for running ads and promotional posts on Facebook – and for mobile, as distorted or confusing images on mobile can disengage users. Highly-engaging images created for Facebook can often become pixelated or cut off by simply neglecting to use the correct dimensions. Referring to the below infographic will ensure you are able to attract customers or engage your target audience.